What is Bountygate? A Definitive Guide. 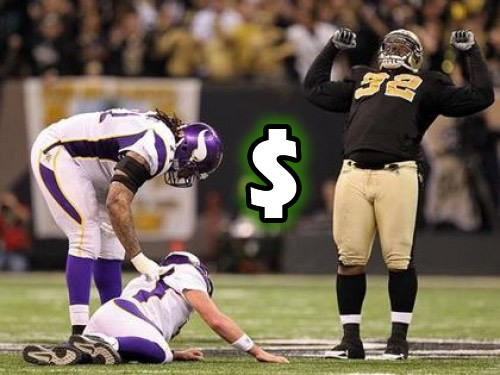 So you think the Saints were paying out bounties for big hits and injuries on opponents? Actually, you're right, they were, but they were far from the only ones doing it and their penalties were way out of line with other, far more serious, NFL infractions. Check below. WHAT: Saints defensive coordinator Gregg Williams developed the program during the 2009 season. According to the NFL's findings, Williams and players pooled their money, and awarded cash prizes to players who injured select members of the opposing team. The league discovered that anywhere between 22 and 27 Saints players were involved, and that head coach Sean Payton was both aware and involved in the program’s cover-up. As a result of the league's findings, Payton was suspended for the entirety of the 2012 season, Williams was issued an indefinite suspension, assistant coach Joe Vitt received a six-game ban, linebacker Jonathan Vilma was given a one-season suspension, defensive lineman Anthony Hargrove received eight games, defensive end Will Smith four and linebacker Scott Fujita three. Former commissioner Paul Tagliabue, who oversaw the appeals, overturned the suspensions of four current and former New Orleans Saints players, although he still found that three of the players engaged in conduct detrimental to the league. Tagliabue said the players participated in a performance pool that rewarded key plays -- including bone-jarring hits -- that could merit fines. But he stressed the team's coaches were very much involved. It is widely believed that the Goodell used the outsized fines to end the practice of bounty football forever. YOU'RE WRONG IF YOU THINK: The Saints were the only team to conceive of and run a bounty program. REALITY: Many teams in the league had similar programs. Way back in 1994, the Green Bay Packers had a program administered by Pro Football Hall of Fame defensive end Reggie White called "Smash for Cash." The league was OK with it then. An unnamed NFL spokesman said, "The 'Smash-for-Cash' program is within the rules as long as players use their own monies, the amounts are not exorbitant, and the payments are not for illegal hits." YOU'RE WRONG IF YOU THINK: The Saints were punished so steeply because of severity of their cheating and unsportsmanlike conduct. REALITY: The Saints did the wrong thing, there's no arguing that. However, Commissioner Goodell used this incident -- just like he used the Patriots' "Spygate" penalty -- to send a clear message to the entire league that bounty-football had to stop. The highly punitive penalties were excessive, but did the job. Bountygate is now one of the "famous" NFL cheats that other teams will avoid at all costs. Many of Goodell's orignal penalties were actually overturned by former commissioner Paul Tagliabue, who was appointed to oversee the players' appeal of their suspensions. This was a stunning rebuke of Goodell's judgement, and apparently damaged the relationship between the former and current commissioners. Think something should be added to this summary of Bountygate? Is there a broken link? A fact that need clarification? Email The Commish (with supporting links) and he'll take care of it just as quickly and professionally as Roger Goodell would.